When I was introduced to Pilates back in 2001 I had no idea that it would change my life. After a few months of practicing the Method I noticed some remarkable changes in my body and mind. Namely that my elbow tendonitis had disappeared, and that I was less anxious and happier. 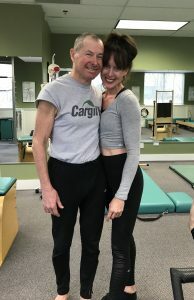 My mentor, Richard Rossiter said, “Pilates is a Lifestyle.” At the time I thought it was just a romantic saying people said about their passions. But after all these years I’ve realized that it’s true. Pilates is a lifestyle. In Joseph Pilates’ book, Return to Life, he defined Pilates (Contrology) as the complete coordination of body, mind, and spirit. According to Joe, one of the main purposes of doing Pilates was to “gain mastery over your mind and complete control of you body.” It is well know that our thought life determines our words and our actions. Gaining mastery over our mind has enormous potential to improve the quality our physical, emotional and spiritual well-being. Joe also said, “Contrology steadily increases the normal and natural supply of pure rich blood to flow to and circulate throughout the brain with corresponding stimulation to new brain areas previously dormant. More significantly, it actually develops more brain cells.” Seriously! Modern day neuroscientist Dr. Caroline Leaf and author of the best selling book, Switch on your Brain, confirms Joe’s assertion from nearly a century earlier. “The brain continually changes in response to mental and sensory signals throughout the human life span. This process has now been termed ‘neuroplasticity’. It was once thought that, as adults, we had the full complement of nerve cells (neurons) and that we basically lost neurons until we died.” Dr. Leaf goes on to say, “Toxic thoughts trigger negative and anxious emotions, which produce biochemicals that cause the body stress. They are stored in your mind, as well as in the cells of your body”. Here’s where I believe Dr. Leaf’s research and Joe’s Method collide. Joe’s assertion that, “Change happens through movement and movement heals.” is indeed a fact. By breathing deeply, articulating our spines, making space for organs to function better, articulating our joints through their healthiest ranges of motion and visualizing new possibilities, we feed our bodies fresh sensory input, remove toxic thought patterns and allow new thinking to emerge for greater physical, mental and spiritual well-being. Yes, I believe that all of this can happen in a single Pilates session. But like anything, repetition and reinforcement is the key to lasting change. When I teach Pilates I use a lot of imagery focused on allowing the body and mind to easily communicate creating an ideal environment to tap into the brain and body’s amazing capacity to change, adapt and heal. Additionally, breathing is at the heart of my teaching. Joseph made statements such as, “Breathing is the first act of life and the last, and that we must learn to do it well.” With an emphasis on breathing deeply, we stimulate the parasympathetic nervous system which focuses the mind and calms the body. Deep breathing flushes out the toxins in the body and brings new oxygen in. In our time together, you’ll also notice a lot of affirmation, and opportunity to explore and discover new ways to feel and live in your body. You’re body is not stagnant, and neither is your mind. You are capable of transformational growth. I don’t care if you are 17 or 71 – you are capable of transforming your mind, body, and spirit! “Do not conform to the pattern of this world, but be transformed by the renewing of your mind.” – Romans 12:2. Pilates is a lifestyle I live, breathe and love. It goes with me whether I am rock climbing, working at my computer, or cleaning my house. As your Pilates coach I will guide you beyond old patterns that may no longer serve you and into new possibilities that make you thrive. 17 years ago my mentor, Richard believed in me and the Pilates Method – I am eternally grateful! I want to do the same for you.